AC or DC Drives Comparison: Which is best for you? An AC drive stands for Alternating Current, but could also be referred to as an adjustable speed drive, adjustable frequency drive, variable frequency drive, variable speed drive, frequency converter, inverters and a power converter. Typically, they are used to control the speed of an electric motor in order to enhance the operation of numerous applications relying on electric motors, minimize mechanical stress on motor control applications, generate energy as efficiently as possible, cut down on energy usage and, lastly, optimize process control. Also known as adjustable speed drives, inverters and power converters, adjustable frequency drives, and variable speed drives, AC drives are similar to DC drives because an AC input is regulated to DC by simple bridge rectifiers, commonly referred to as SCRs. Because AC drives use a capacitor bank to stabilize and smooth this DC voltage, the DC output would be half cycle according to AC input phase frequency. Then, power is supplied to the motor in the output section of the drive by means of 6 output transistor or IGBT modules. Essentially, the AC input current is converted by the drive to DC and, again, converted back to AC in order to supply the motor. The current is converted twice by the drive because the AC input is either 50 or 60-hertz cycles. When the DC voltage is converted to AC again by the drive, it uses a carrier frequency of at least 2 KHZ to 100 KHZ in more complex drives. Therefore, the output current is able to be raised tens or hundreds of times without burning up the motor coil. The AC motor is also able to rapidly switch speeds with zero problems because of this function. AC drives typically have numerous types of feedbacks from simple, 2-line incremental encoders, to resolvers or absolute encoders with a significant resolution that facilitates the drive to calculate motor shaft speed and angle as spot-on as possible. There is a third circuit called regeneration on a handful of larger, more powerful drives. This circuit converts the inertia of the load and motor to AC power and transfers it back to the input lines when the motor transitions from a significantly high speed to a low one, which, in the long run, would conserve on power and increase energy efficiency. 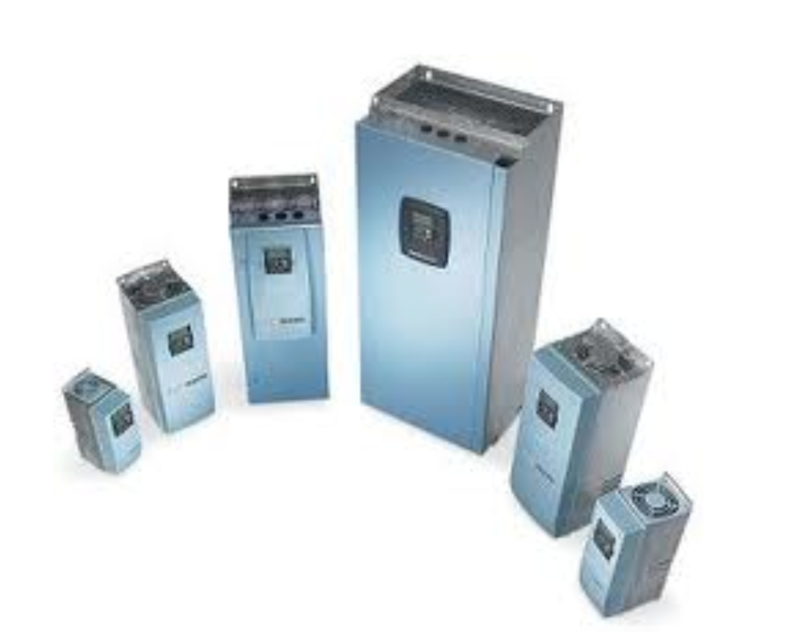 AC drives serve many different industrial and commercial applications. Essentially, a DC drive converts an AC drive into direct current, otherwise known as DC to operate a DC motor. The majority of DC drives use a handful of thyristors (also known as SCR’s) to craft a half cycle of DC output from a single phase AC input, also known as the half-bridge method. The more complex ones use up to 6 SCR’s to power a DC output from a 3 phase AC input, which is known as the full-bridge. Therefore, in the full-bridge method, we have 2 SCR’s for every input phase. The aspects of a DC drive are as follows: compact in size, outstanding speed regulation, broad speed range, cost-effective for medium and high HP applications, and speed changes that are derived from by increasing or decreasing the amount of DC voltage the drive feeds the motor. Controlled by the gate input, an SCR switch is similar to a one direction switch and turns on by applying a low voltage to the gates. The drive can control the motor speed by applying the voltage to the gate at a contrasting angle of the input phase. To authenticate the motor speed and compensate if necessary, the majority of DC drives require the motor to have a tachometer as means of feedback. A tachometer is essentially a mini permanent magnet DC motor accompanied by the main motor’s shaft. Because higher motor speed generates more voltage in the tachometer, the drive references this voltage to ensure the motor is operating at a correct speed per-user settings. More compact DC motors have a permanent magnet field while larger DC motors have a separate coil inside the motor, also known as a field, which eliminates the need for a permanent magnet in the motor. DC drives with field output typically have a more compact circuit to supply the field coil. 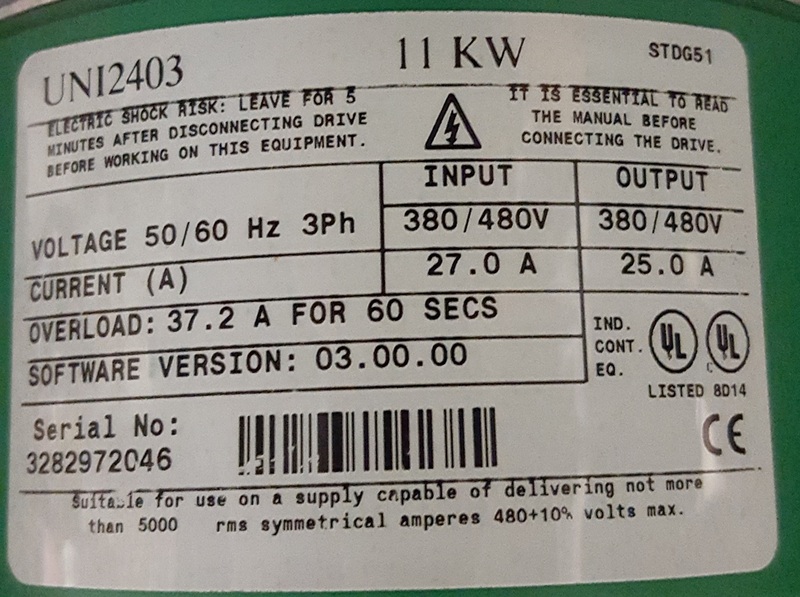 DC drives are best used in when a DC motor exists in a safe and dry atmosphere and the use of DPG, DPG-FV, TENV, or TEFC motor enclosures is required, motor speeds are able to reach 2500 RPM, application requirements are medium or large, and starting torque is either unpredictable or greater than 150%. 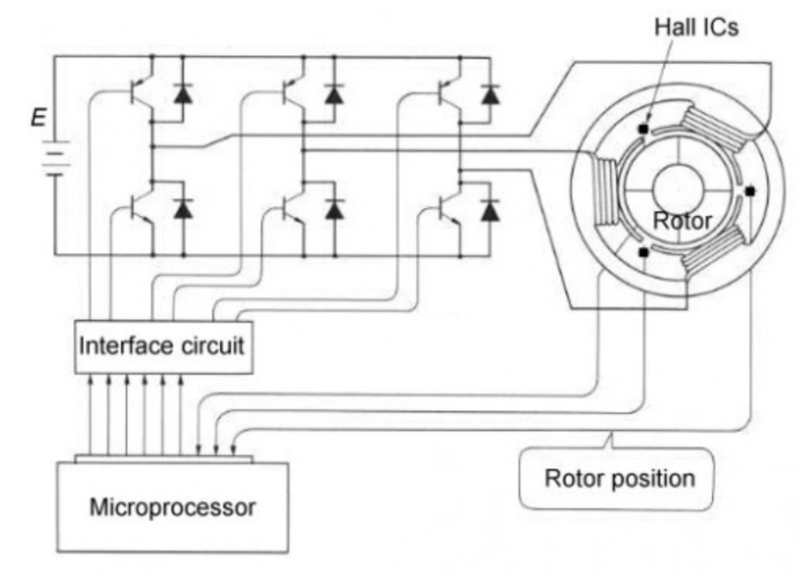 DC drives are commonly considered problematic, despite their prestige for having simple circuits, providing high start-up torque, and being ideal for applications with constant speed due to the requirement of commutators and brush assemblies in their motors. These motors can become worn over time, have operational issues, and will likely require labor to preserve. On the opposite side of the spectrum, AC drives are considered more energy-friendly and are able to endure rapid speed changes more efficiently due to their running induction motors. Often times, they have hundreds of numerous programmable parameters for secure protection. Although, because of these factors, the AC drive is more complex, modernized software is simplifying their overall use. In previous years, DC drives were regularly utilized due to their simplicity, the majority of machine manufacturers prefer to use AC drives as of late. The complexity of an AC drive has been repeatedly simplified and fine-tuned, resulting in a plethora of advantages. Though in the past DC drives were often utilized due to their simplicity, most machine manufacturers now prefer to use AC drives (especially for servo applications). The intricacy of an AC drive has been simplified over time and has many upper hands. MRO Electric and Supply has new and refurbished Control Techniques parts available now, and also offers repair pricing. For more information, please call 800-691-8511 or email sales@mroelectric.com. When a failure occurs with the CDE drive the display will flash a series of segment characters for the trip. Commander CDE series stores the past ten failure codes in parameters #10.14 – 10.23 in trip number form. A numeric value trip code is a basic form of the symptom for the technician to work with. These past trips can be accessed via the keypad by entering the value of 149 in the keypad at parameter 00. Scroll to menu 10, for parameter #10.14 to see a trip number. Symptom explanations provide an avenue on how to analyze the drive for particular problems. To make the troubleshooting process easier a chart was created to link the type of trip with the symptom. Oh 4 Heatsink over temperature- Fan Failure ??? EPS 11 External power supply fault +24vdc short? The Unidrive SP can be enabled to run in several ways. The drive can use digital inputs, keypad, or a field buss networks to give the OK to run. The drive will display inh, rdy, or run depending on the given commands. The drive can be programmed to use positive or negative logic. The logic type is set up at #8.29 in the Control Techniques Unidrive SP. The Unidrive SP defaults to positive logic. When the drive is in positive logic you will need to inject +24VDC to activate the digital inputs. 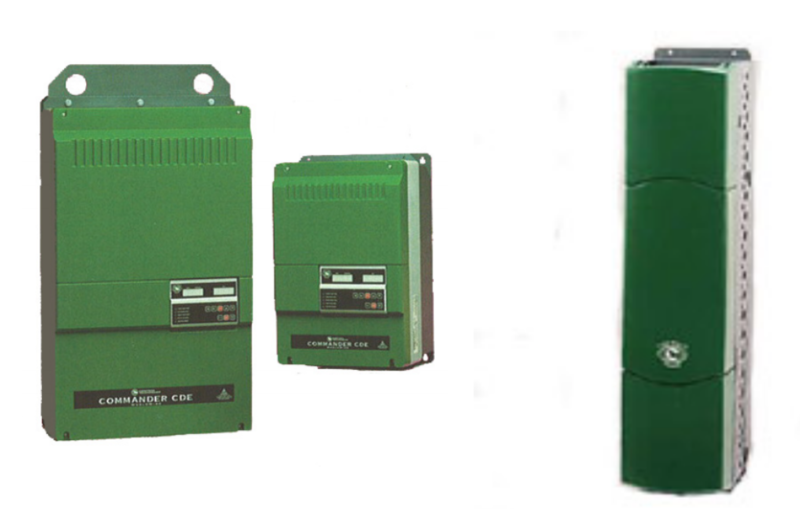 The +24VDC can be supplied by the drive or externally. The Unidrive SP can be enabled to run in numerous ways. Parameter #0.05 sets up the Reference Select. This will tell the drive where to search for run commands and speed references. You will only need to close the enable signal if it is set to pad. Then, the keypad can be used to control the drive and to set the speed reference. The speed reference will come in on an analog input if you choose a terminal code. The digital inputs will select the enable, run, and preset selections. 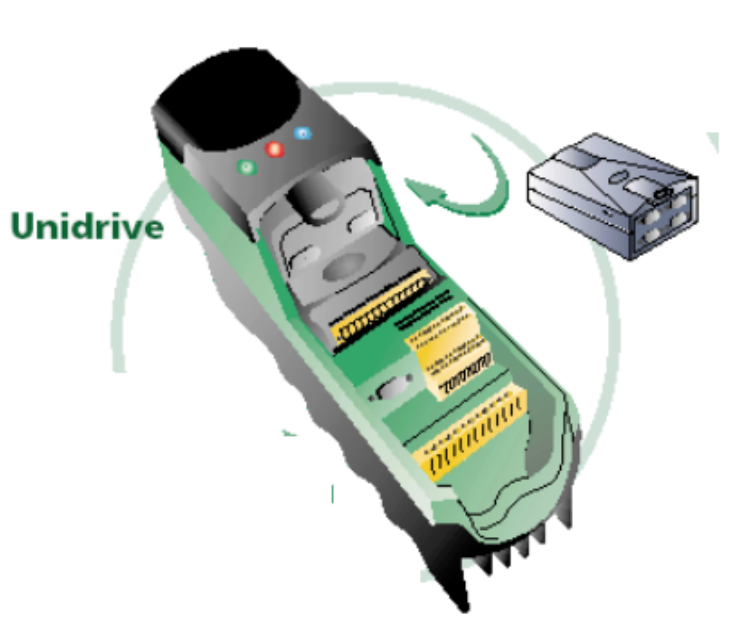 The drive should operate as seen above if the digital inputs are activated correctly. The voltage on the corresponding digital inputs should be measured if the parameters in menu 6 aren’t changing state accordingly. The DC voltage should change between 0VDC and 24VDC when a command is given. Check the digital input configuration in menu 8 if menu 6 isn’t changing and the voltage is. To control the start/stop functions, the drive does not have to use the digital inputs. When #6.43 = 1 the control word is enabled. The drive will now accept a decimal value from 0 to 32767 at #6.42. This decimal value can be converted to a binary value.To see the function that will be carried out, you can reference the binary value to the chart below. The drive still may not run if the digital inputs and the drive sequencer are each working properly. There could be an issue with the speed reference to the drive if the display shows Run but the motor isn’t turning. 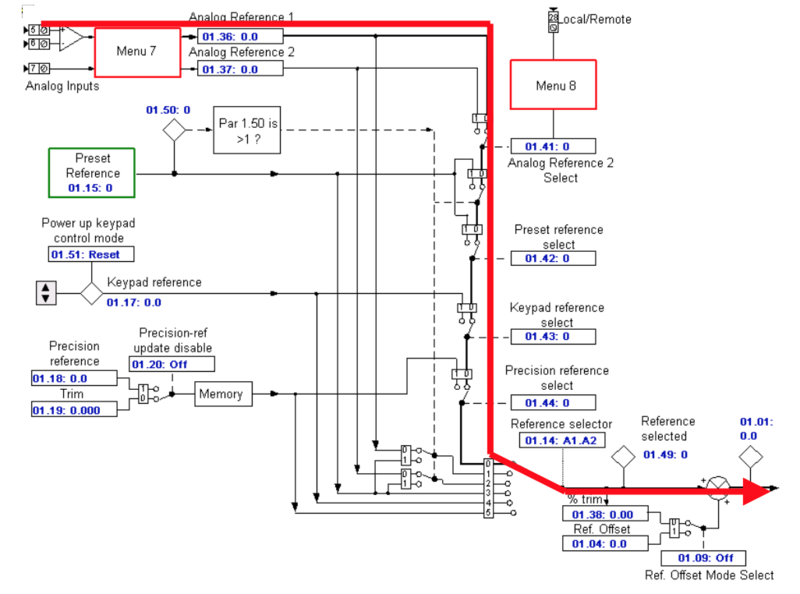 The speed reference is able to be applied in several methods. An analog input can be used (current or voltage), preset speeds, and a field buss reference. The example is a 0-10VDC signal on analog input #1. The final speed of the demand is parameter #3.01. The speed reference should be displayed here if the digital inputs and the drive sequencer are failing to operate properly. Check menu 1 and 2 to determine where it is stopping if the reference is not getting to this point. 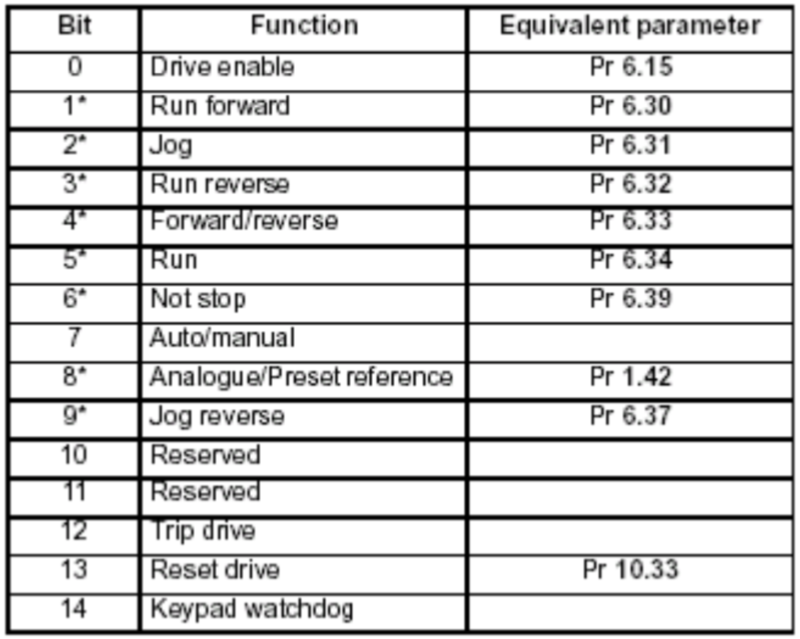 If the drive is running in torque mode, the torque reference will come on parameter #4.08 under default conditions. 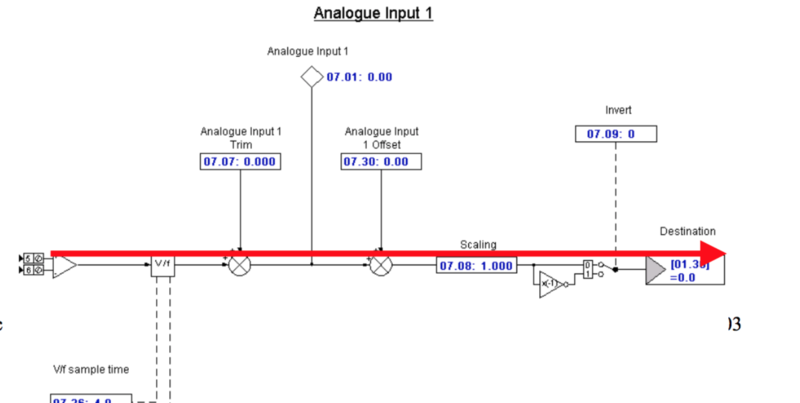 #4.08 is able to be linked to an analog input or be written to via a filed buss network. #7.01 should be inspected to determine if it changes with the change in reference at terminal 5 once the signal has been confirmed. #7.01 goes from +/- 0% – 100%. Check the destination of the speed reference at #7.10 if everything looks good. Follow it to the destination and confirm the speed reference value is arriving there and then through #3.01. Contact the America’s Service Center if the drive will still not run after the Speed Reference, Digital Inputs and Drive Sequencer have all been confirmed. 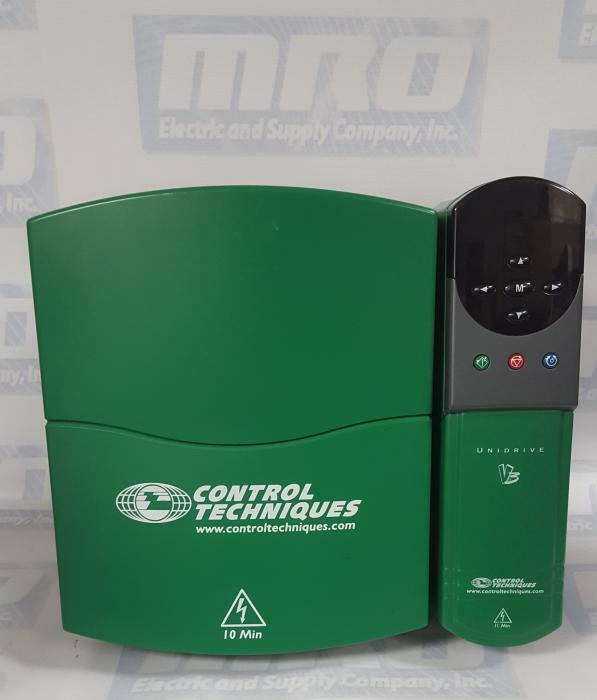 MRO Electric and Supply has new and refurbished Control Techniques Unidrives available now, and also offers repair pricing. For more information, please call 800-691-8511 or email sales@mroelectric.com. 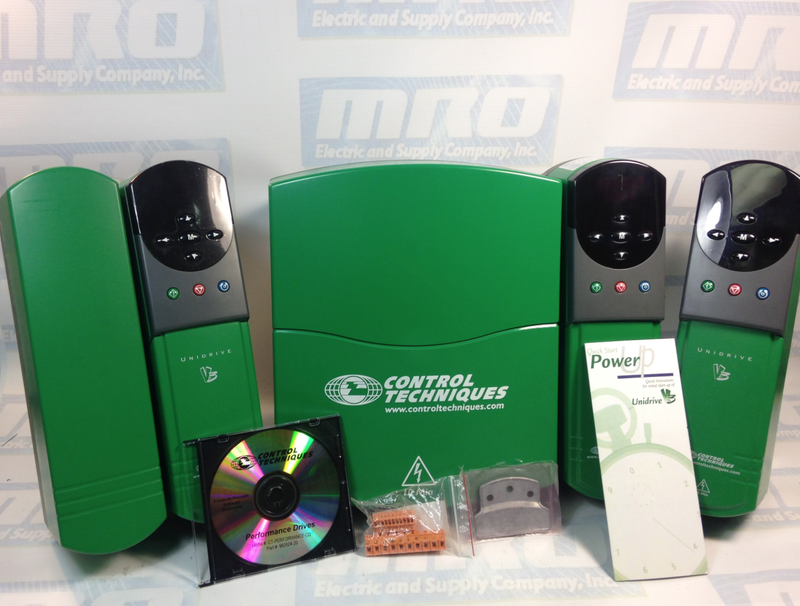 MRO Electric and Supply has new and refurbished Control Techniques Unidrives available now, along with our other Control Techniques products. Contact us about pricing for repairs. For more information, please call 800-691-8511 or email sales@mroelectric.com. All of the above HF trips in BLUE are typically a result of some sort of hardware failure on the UD90A control PCB. This control board is common to all Unidrive Classics. If one of the UD7x large option modules is removed, the trip may be expected. There is an issue with either the large option module or the UD90A control PCB if this trip occurs at any other time than the case above. Because the UD90A control PCB was unable to recognize the power rating of the power PCB it is connected to, this trip occurred. The trip is likely due to the power PCB in the Drive or a problem with the UD90A control PCB on Unidrive Sizes 1 to 4 (which includes UNI1401, UNI1402, UNI1403, UNI1404, UNI1405, UNI2401, UNI2402, UNI2403, UNI3401, UNI3402, UNI3403, UNI3404, UINI3405, UNI4401, UNI4402, UNI4403, and UNI4404). UD99 PCB or the UD90A PCB cause the trip on a Unidrive Size 5. The interconnects between the PCBs should also be checked, as they could also cause a trip. Due to an issue with the current feedback on the drive, this trip occurs. The trip is likely due to the power PCB in the Drive on Unidrive Sizes 1 to 4. An issue with the UD90A control PCB may also cause this trip. The UD99 PCB or the UD90A PCB cause the trip on a Unidrive Size 5, along with the interconnects between the PCBs. This trip can result from a faulty UD7x Co-Processor. With power off, remove Co-Processor and re-apply power. If one of the UD7x larger option modules is removed while the Drive is powered up, this trip is likely to occur. There is an issue with either the UD90A control PCB or the large option module if this trip were to occur at any other time. The UD90A control PCB was unable to recognize the power rating of the power PCB it is connected to, which is what caused the trip. The trip is likely due to the power PCB in the Drive on Unidrive Sizes 1 to 4, however, an issue with the UD90A control PCB is also able to cause this trip. The trip is caused by the UD90A PCB, the UD99 PCB, or the interconnects between the PCBs on a Unidrive Size 5. If there is an issue with the current feedback on the Drive, this trip will occur. The trip is likely due to the power PCB in the Drive, but an issue with the UD90A control PCB could also result in a trip on Unidrive Sizes 1 to 4. On a Unidrive Size 5, the trip is cause by either UD99 PCB or the UD90A PCB. The interconnects between the PCBs could also cause this trip and should be checked. A trip could be caused by either UD99 PCB, UD90A PCB, or the interconnects between the PCBs on a Unidrive Size 5. A faulty UD7x Co-Processor and large option module, ( includes UD70, UD71, UD73, UD74, UD75, and UD76) can cause this trip. Remove Co-Processor and re-apply power with power off. You can check out our previous blog post on the UD73 here for additional setup and configuration info. For UD73 configuration, most common parameters are arranged in one concise menu. Hundreds of user-configurable functions separated into 20 logical menus provide quick setup for advanced application. For positioning, ratio control, camming and multi-axis systems, plug-in option modules easily extend the Unidrive’s capabilities. High horsepower Unidrives cover the range from 200 to 1600 HP. The 300 amp power module and control pod (the “brain”) are available as components. They are also available as a packaged drive solution that includes fusing and a disconnect. (See our Packaged Drive Section, pages 120-123 and 128-133.) With the UD73’s extensive selection of communication, application, feedback and I/O modules, you can easily upgrade the performance of your drive. Yet, it is simple to configure by using the drive keypad, a remote keypad (CTKP), or UniSoft, the UD73 Windows based drive set-up tool. You can tailor each Unidrive to be the drive you want when you want it. The UD73 configuration is suited for use with AC brushless servo motors. Servo control is ideal for applications requiring load transfer to and from any position, at any speed. 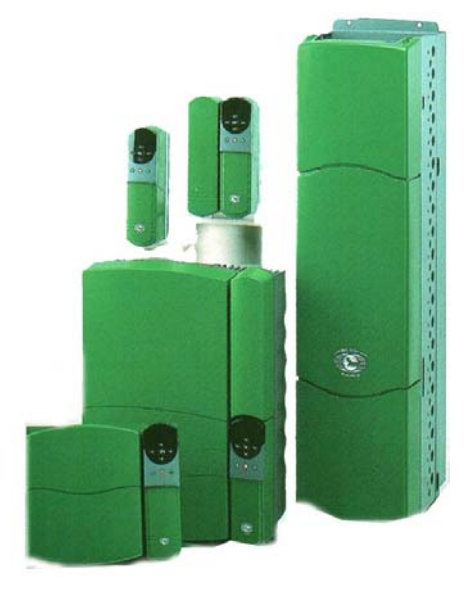 The UD73 is designed for both stand-alone and multi-axis system applications. of either supplying power to the DC bus of the Unidrive controlling the motor or removing power from the DC bus of the Unidrive controlling the motor and returning it back to the power line. If you would like to order a module or get more info you can email sales@mroelectric.com or call 1-800-691-8511. The UNI3405 Unidrive is part of the Classic Unidrive series. Control Techniques introduced the Unidrive Classic around 1993 in Europe and approximately 1995 in the Americas. Because the Unidrive Classic ran simple Open Loop, Closed Loop Vector, and Servo motor applications as well as offering a Regen mode, the UNI3405 found its way into a great many industrial applications, from simple to quote complex. 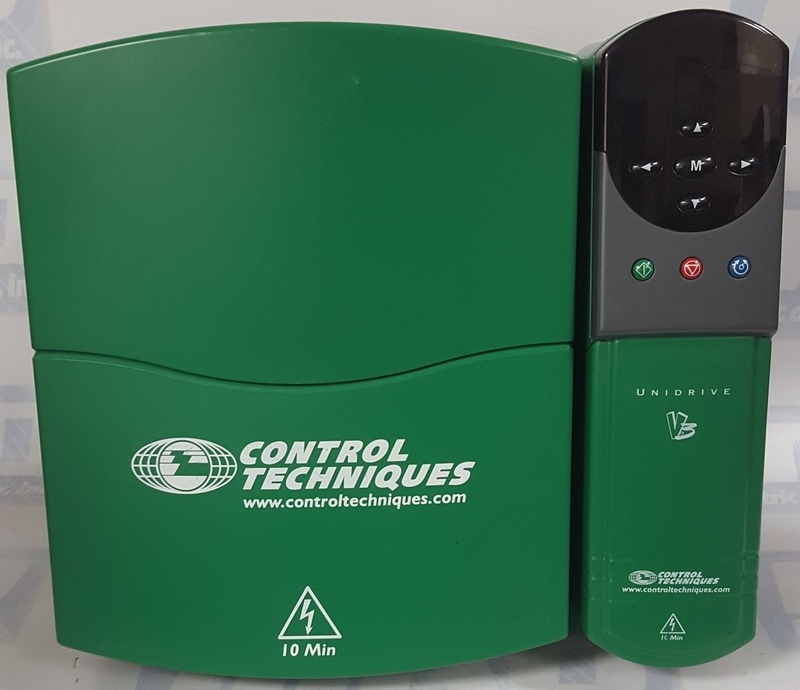 Visit our website to checkout all of our Control Techniques products. Due to its status as a legacy product, the UNI3405 is becoming available only in limited quantities. The UNI3405 contains approximately 500-600 parameters that help machine manufacturers achieve the desired functionality for a certain machine requirement. Some applications may require 20-30 or more parameters to be changed from the drives factory default settings. Should drive replacement become necessary, one must have a complete and accurate list of these parameters so that the original functionality can be restored. If you do not have a list of the required parameters, one could copy down these parameters manual. This is assuming that the drive still works enough to power the display, and even then the manual copying of parameters is tedious and error prone. For more info you can visit our product page here. You can get price and availability by emailing sales@mroelectric.com or calling 1-800-691-8511.